This cozy log cabin is the perfect, private getaway to relax to the sounds of Lower Alarka Creek. Creekside Hideaway has everything you need for a couple or small family. A comfortable Queen bedroom and a leather sleeper sofa makes it sleep 4. One Full bath tub/shower combinations. Enjoy the soothing sounds of the creek while relaxing on the porch with your morning coffee. Later on, grab your fishing pole and fish right there in the creek. Easy access with outdoor hot tub, fire pit, gas grill and charcoal grill available. We had an incredible time! Your cabin is delightful and set up perfectly! After a long day of play - from fly fishing to horseback riding and white water rafting, the Hot Tub was amazing! We hop to come back again. Thank you for a wonderful stay. Everything was great. We even checked out the horseback riding attraction. The staff at Great Smokys Cabin Rentals are awesome: so friendly, helpful, and professional. I called a few times with questions, and the staff was always extremely gracious and prompt to attend to any needs I had. This cabin is great. A very cozy and private feeling spot, yet spacious inside with plenty of room, a great kitchen, and fabulous hot tub with a view of Alarka Creek! We enjoyed the sounds of the creek bubbling the rocks, and also, the fire pit right near the creek. A very relaxing way to spend some of the holiday season in 2018! The cabin is close to many great hiking trails, including Tsali Recreation Area. Pet-friendly, and very friendly staff to provide information about the area. Highly recommended! We love the hot tub with the sounds of the creek in the background, and the fire-pit! We loved being able to sit on the porch right by the creek, so peaceful! We loved the quaintness of the cabin. Relaxing by the creek. Thank you for letting us stay in your cabin on short notice. We had fun! Thank you so much for letting us enjoy your cabin for my birthday. We had a blast. We walked a few feet on the Appalachian Trail, walked and drove across Fontana Dam!! Went hiking, tubing and took the train ride. We also fished on the creek each day and relaxed in the Hot Tub every night. Beautiful cabin - Inside and Outside. Clean and comfortable and totally relaxing. We really enjoyed our stay here and dreaming about our next visit! This was our second time staying at Creekside Hideaway and we love the creek and its serenity.Team members have always been helpful and we appreciated the call to check on our arrival. It was a very cute little cabin and had everything we needed for our small family. We enjoyed the hot tub, firepit, and wonderful little creek, and our kids really enjoyed the novelty of sleeping together on the sofabed. 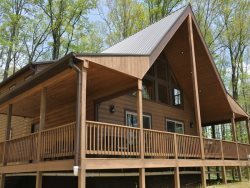 We were so thrilled with this cabin! The interior was nice and suited our needs, but the back deck, yard and stream is where we spent most of our time...despite it raining nearly nonstop for three days! Dogs being allowed is a MAJOR plus! The kitchen was well equipped and there is both a gas and charcoal grill. We really enjoyed the cabin this week. Everything about it was perfect. Waking up every morning and having coffee on the porch listening to the creek is just good for the soul. This trip was our 15th wedding anniversary. We couldn't have picked a better place. Plus we were able to bring our fur baby with us! This cabin has such a wonderful feeling of comfort. We had a perfect very much needed vacation at Creekside Hideaway cabin We got to see Cades Cove, Fontana Dam, Nantahala Gorge, Bryson City but the best was relaxing on back porch. We received plenty of assistance before our stay by phone and email. I felt very sure the staff would be very accommodating if needed however our stay was perfect. Thank you and we will return. We have used GSCR before. This is a very nice cabin, great view, lovely garden surrounding the cabin! My husband tried fishing in the creek, I rode the train, and naturally we went through the National Park! We loved being on the creek! We loved the cabin and being on the creek. We went tubing and hiking! The cabin was very nice! If we are ever back that way we would love to stay there again. The cabin was awesome, beautiful and peaceful by the creek, very homey. We really enjoyed our week at Creekside Hideaway! The cabin was great, even on rainy days. We enjoyed sitting on the porch listening to the creek with a cup of coffee. The sounds of nature around you are so relaxing. The cabin is just a short ride to anything you want to do, beautiful waterfalls at Deep Creek. We will be back! GSCR is always very friendly and enjoyable to work with. Beautiful cabin inside and out. A very relaxing stay. The creek was fantastic! Really enjoyed this cabin! Fishing, Fly Fishing Museum, Hiking and seeing 3 waterfalls in one day. Grilling on the back deck, listening to the river, Jacuzzi in the rain, taking lots of pictures, and just enjoying the outdoors. Thank you for a memorable and wonderful 20 year anniversary. We will be back. Oh and loved to be rocked to sleep by the sound of the river.